Clashes between police and students in Colombia’s third largest city, Cali, left one protester dead and six injured, the city’s security secretary confirmed Wednesday. Students told local newspaper El Pais that the protest sought to reject the death of a fellow-student in an explosion that killed nine in the Dagua municipality where thousands of native Colombians have gathered in protest. The protest reportedly turned violent when hooded men started throwing home-made bombs to police. “One person died apparently when manipulating explosives. At least six people are injured,” Cali Security Secretary Andres Villamizar was quoted as saying by newspaper El Espectador. The government official rejected the riots that also damaged buildings inside the Univalle campus and several buses. “Protesting is one thing, but the acts of terror we have seen are an entirely different thing,” Villamizar said. According to newspaper El Tiempo, the rioters shot home-made mortars to overflying police helicopters. 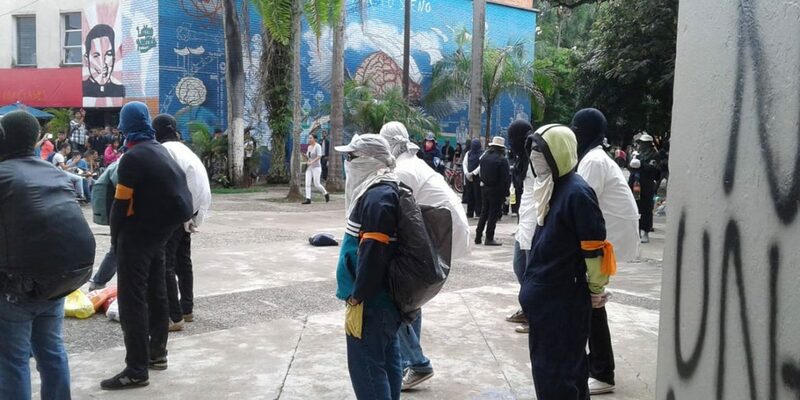 The riots in Cali come less than a week after similar violence broke out at the University of Antioquia in Medellin, Colombia’s second largest city. Also the protests organized by indigenous nations have been marred by unrest, but this violence has mainly been attributed to police and guerrilla groups. The native Colombians, who also receive the support of black minority and peasant organizations, have been protesting for weeks in an attempt to force the government to respect their rights and comply with agreements made in the past.